We would say that we bought Cookie Doodle for our kids to have some weekend fun but really we have been creating fun ‘cookies’ to put in our emails and annoucements. But, lets say you were looking to have some fun with your kids or going to let your kids play on your iPad for a bit (we prefer the quality family time side). 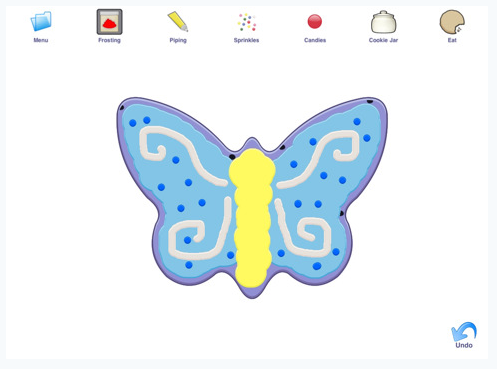 Amongst our selection of drawing apps, we have added Cookie Doodle to the page of our fun apps. You can choose from over 100 different cutter shapes, many different types of dough, frostings and add-ons like sprinkles and candies. These are not additions to the program, all these options come in the basic app. Cookie Doodle is a full end to end cookie making process. Pick your dough, cut it, bake it and decorate it. Then, you can share the image of a cookie or a plate of your creations via an email. The backgrounds and images are on the simple side but that doesn’t distract from the true fun of kids making cookies without the cleanup.